Running short on Time? Let us manage your election. 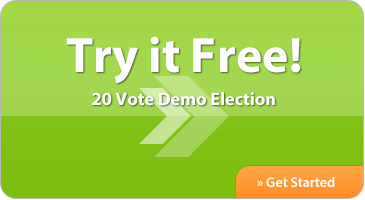 This service includes complete ballot development and up to 3 emails to voters with links and information for voting. Our staff will provide ongoing technical and administrative support necessary to manage your election from start to finish. You and Balloteer make doing this each year so easy. Your customer service and staff are exceptional." Thank you again for all of your assistance this year! Greatly appreciated and look forward to working with you for next year's elections!" My experience with Balloteer was very positive and I received lots of written feedback from our membership expressing their delight with the voting experience." My CEO is very pleased with the process and service we continue to receive with your product. Thank you again." We have used Balloteer Vote Online for the past seven community association elections (great system incidentally!)." I work for a labor union and we have seven chapters that utilize Balloteer online balloting. All of the chapters have reported that using online balloting has increased the number of people who vote." We had overwhelmingly positive feedback from our members on the ease of voting – we will use your service again for future elections." This was the best ever! We will absolutely use Balloteer Vote Online again for our ORU Alumni Board of Directors Elections." Thank you again for everything. The process and customer service you have provided was one of the best I’ve seen and quite surprising due to not talking on the phone." I am so impressed and so happy that I learned about your company! I have recommended your software to two other veteran associations." Electronic Elections Continue to Build Member Response and Save Money for USA Branch." Well, our 2nd year with using your system and we LOVE it." It does not get any better than this. It is so easy -- I had no problems in setting everything up. Thanks for a great product and great people." Very smooth thanks to Balloteer.com. I can’t say enough abut the service you have provided. We will be sure to use you in the future." We have been using Balloteer since 2009. The Balloteer Managed Elections are wonderful because they handle everything. They have competitive pricing and the customer service is excellent." I am most appreciative for your excellent customer service. You all have been outstanding." You are a life saver! Thanks for all the suggestions and the help!" The Balloteer staff have made our Special Election seamless for all of us. We are extremely grateful for the kind of service you have provided us." Thank you very much for excellent support and timely setup. I couldn’t have received better support than what you and your team has provided. Thank you for being there for us all the time – especially weekends."